We have some sad news to report. Bill 24 – the legislation that guts environmental regulations, weakens measures that protect pigs from barn fires, and opens the door to pig industry expansion in Manitoba, passed earlier this week. Unsurprisingly, Manitoba Pork has been quoted as saying it fully expected the bill to pass. If one thing became clear during the public hearings, it’s that the conservatives planned to push the bill through, regardless of the ethical and environmental implications of it. Perhaps also unsurprisingly, on the day of the bill’s passing, Manitoba Pork increased its estimate for the number of barns it hopes to build from 80 to 100. 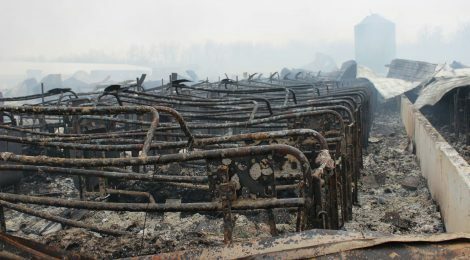 Just a few days prior, 7,500 sows and piglets burned to death in a massive barn fire. The barn was located in a Porcine Epidemic Diarrhea “buffer zone”, leading to wide speculation that the barn had been infected. Thank you to everyone who fought to prevent this bill from being passed. The fight will now move to the municipal level where we’ll continue to work to block building of the new barns individually as they are proposed. We will never give up – it’s the least the pigs deserve. ← NFACC Has Agreed to Help Prevent Barn Fires!